Pharmacy is the profession, which is the concern with the art and science of preparing from natural and synthetic sources, suitable and convenient material for distribution and use in the treatment and prevention of disease. Pharmacy provides a knowledge of identification, selection, synthesis, pharmacological action, formulation of drug and medicines. Pharmacy is also included their proper and safe distribution and use of drugs. Pharmacy is the art and science of preparing and dispensing medication and the provision of drug-related information to be public. Pharmacy is a profession there is a wide scope. Pharmacist is a specialist in medication, custodian of a medical information, companion of the physician, counselor to the patient and guardian of the public health. A pharmacist having an aptitude for business can open a retail drug store to serve the community. Some big drug store engages a number of pharmacists, So as to run them smoothly. The wholesale offers opportunities to a limited number of pharmacists to run a wholesale business of drug and medicines. Pharmaceutical industry offers the opportunity to the pharmacist to all educational leaves. 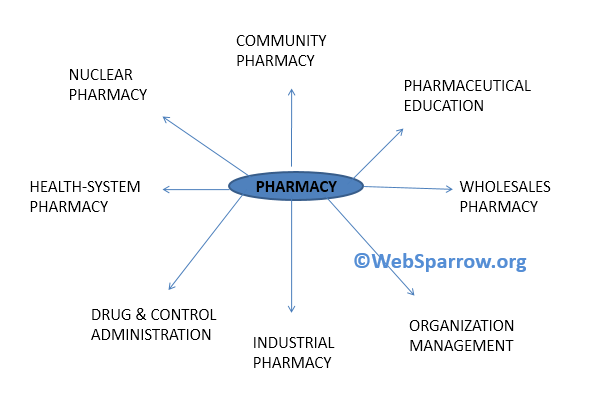 Industrial pharmacy provide job to a pharmacist in the following fields. In production sector, the pharmacist work as manufacturing chemist, he has to supervise to the production of various types of pharmaceutical formulations, packing, labeling, and storage. A manufacturing unit needs the service of an analytical chemist in its analytical laboratory to the testing of raw materials and finished goods manufactured by it. Normally pharmacist with a bachelor degree in pharmacy gets the job of an analytical chemist. A pharmacist has a doctorate degree or master degree in pharmacy is ideally suited for product development in pharmaceutical industry. The synthesis of a new compound to be used as drugs, cosmetics, excipients, industrial chemicals, and preservatives. Research on the cultivation of the medicinal plant. The isolation and purification of the active principle of plant and animal tissue, the determination of their chemical composition and further its synthesis. The preparation of drug in suitable dosage forms designed and its testing to find the bio-availability of the drug. The physical, chemical and biological standardization of drugs. Research on the pharmacodynamics and toxicology of new drugs. The stability of dosage form during its storage and finding its date of expiry. The investigation of the suitability of proposed packing materials and container. Marketing and sales are the performance of services from producer to the consumer. It is the practice of pharmacy in private and government-owned hospitals, health maintenance organization (HMOs), clinics, walk-in health centers and nursing homes. In these, pharmacists dispense medication, prepare the sterile solution, advise other professionals and patients on the use of the drug, monitors drug regiment and evaluate drug use. Nuclear pharmacy applies the principles and practice of pharmacy and nuclear chemistry to produce radioactive drug used for diagnosis and therapy. Due to a rapid growth of pharmaceutical industry and expansion of health service in the country, the demands of pharmacist have increased many a time. Pharmaceutical journalism offers rewarding experiences for a limited number of pharmacists with editing skills. Run both at the level of central government as well as the state governments. The drug and control act provides for the establishment of following agency to maintain drug control administration. Advisory agency- The advisory agency includes drug technical advisory board and drug consultative communities, to advise the government on technical matters related to drug and cosmetics. Analytical agency- Includes central drug laboratories and state drug control laboratories.The main function of these laboratories is to do the analysis and testing of drug and cosmetics or sold within their respective areas. Licensing authority- Licensing authorities are appointed by the central government to issue licenses for the import of drug. This management available for those with pharmacy education who wish to serve in national and state association and on board of pharmacy. Pharmacy Council of India (PCI) and All India Council for Technical Education(AICTE) are other bodies where service of the experienced pharmacist are needs at various levels.